Large double-hulled canoes were once used by the ancestors of Māori to sail from eastern Polynesia to New Zealand. 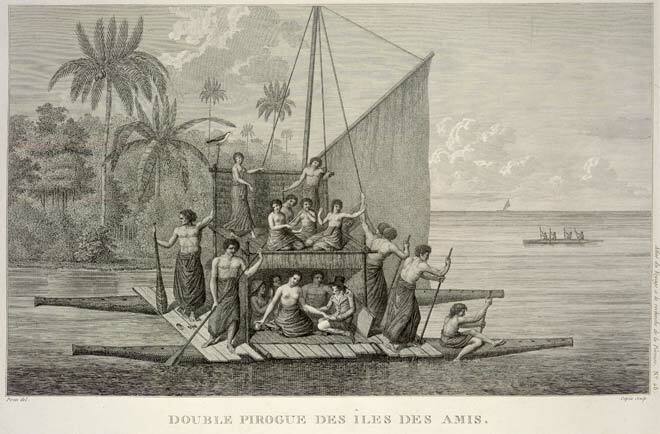 Double-hulled vessels remained in use in other South Pacific countries. This example was sketched in Tonga by the French artist Copia around 1790. It has a simple wooden two-level platform built across two canoe hulls, and is equipped with a triangular sail.